What a fantastic week! I’ve been up to my glaucoma-ridden eyeballs in mid-western experiences. Not the least of which has led to yet another objective being crossed off the list. 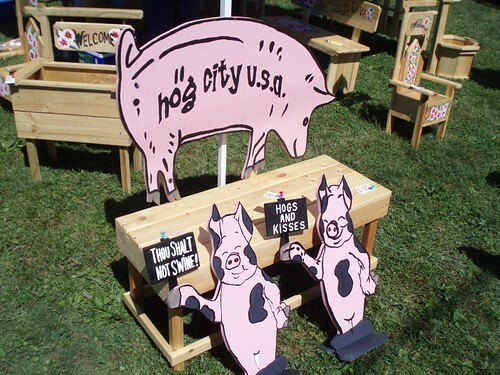 I’ve spent the last couple days experiencing the definition of “obscure small town festival.” Welcome to the wonderful world of “Hog Days” care of Kewanee, IL! 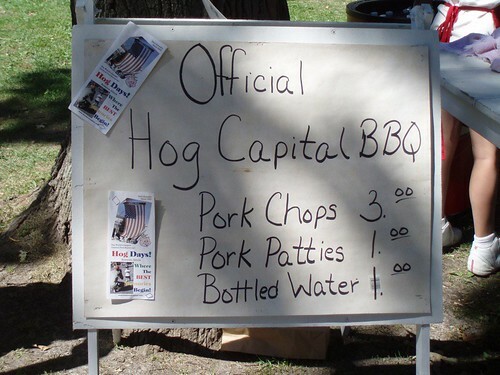 Here’s the rundown: Hog Days manages to cram everything you would expect to see in any movie set in the mid-west into three days. There was a parade, a hog kissing raffle, a flea market and even mud volleyball. After much deliberation (and despite the insistence of the family I’m staying with that I include everything they’ve said and done in the last two days in this story) I’ve decided to focus on just one aspect. The highlight of my weekend came when I met Jean, one of the crafts people with her own booth at the Hog Days flea market. Jean sold one of the most original (read: strangest) crafts I have ever seen in my life. Guess what it was. Go ahead; guess…I’ll wait. Nope. Wrong. Custom embroidered toilet paper!!! Let me just toss this out: what makes small towns great is the quality of relationships between the inhabitants. It’s a shame it’s so much harder to build that solid of a relationship with a fellow citizen in a larger city. I’m sure it’s mostly a matter of trust and since everyone knows everyone in a small town there is a feeling of having that persons reputation controlled by checks and balances. As a result I think that small town folk have an easier time accepting strangers if they are (or at least appear to be) “pre-qualified” for trust by another local. I’m sure that, at least partially because I was rolling six deep with some locals (word. ), but largely because making friends with strangers is what I do, Jean spent some time chatting with me. (I think the reason I wanted to talk to her is pretty self-explanatory. 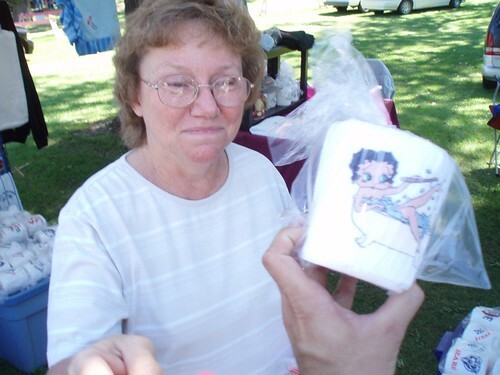 Ask yourself how many times a day you’ve seen someone making a fair living of selling embroidered toilet paper.) After thanking her for her time we continued walking the flea market grounds but eventually we had to pass by Jean’s booth again. “No, Jean. I can’t take your toilet paper!” I couldn’t help myself. I started to laugh. “I insist. I WANT you to take one.” The ping pong game of courtesy went back and forth for a while before I finally collected my embroidered toilet paper and explored the rest of Hog Days a happier man for the roll of two-ply in my bag. I love small towns! I’m done…AND SO IS #30!!! Want to keep living vicariously? I know what you could do! wow!! 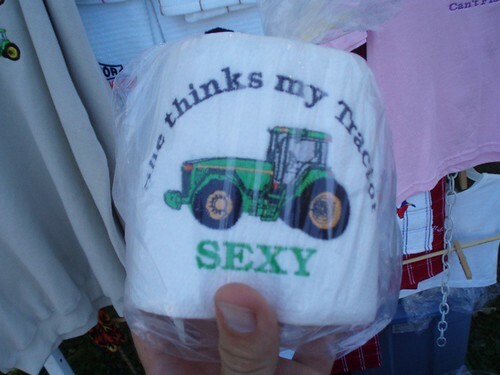 free embroidered toilet paper!?! which one did you choose?? 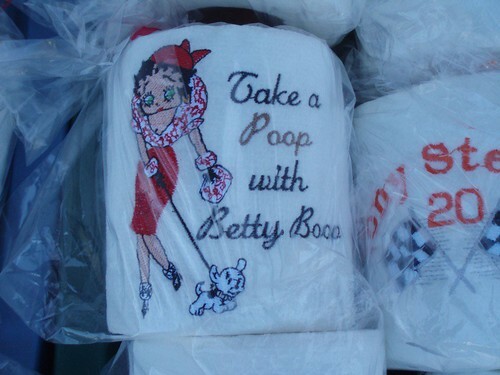 i hope you got “take a poop with betty boop” that’s hilarious!! great to hear you’re having fun crossing #30 off your list! 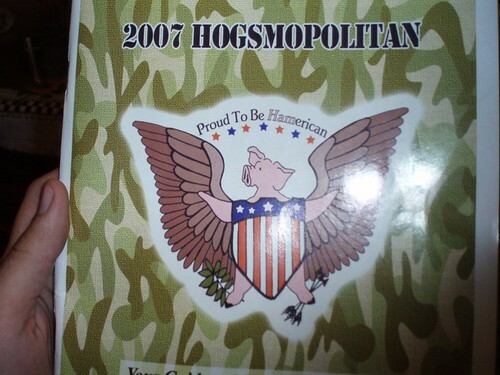 Well…what do you do to “Hog Wallow,” you forgot the details on that. Oh no. Trust me, I didn’t forget. I just haven’t gotten that far yet! You WILL know about the Hog Wallow. I’m curious about the specifics of the toilet paper. Does each individual square have the design on it? Every third square? Just the outside layer of the roll? My birthday is in May and I like the Betty Boop one. I’ll try to remember that in 9 months. Don’t hold your breath. Hi Brett! It was so good to meet you while you were here in the twilight zone, as I like to call it anyway. I am from Kewanee, and Hog Days is the biggest thing to us. People from big towns have no idea what it is like and would never understand. I am really glad you go to partake in Mud Volleyball because that is probably one of the best things about Hog Days. I saw you on CNN and recognized the t-shirt right away and had to find out what item was on the list that brought you to Kewanee, and I laughed when it was “Go to an obscure small town festival.” Hope you enjoyed yourself!! !